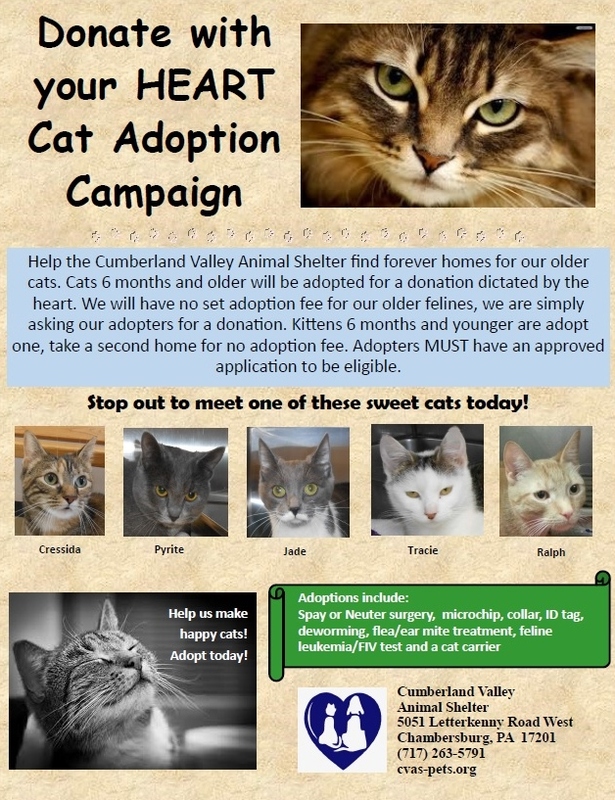 The Cumberland Valley Animal Shelter encourages anyone interested in bringing a four-legged friend into their home to check out the wonderful animals available for adoptions at the shelter. We have dozens of sweet, loving animals that make wonderful pets who are looking every day for a caring home. Potential adopters would need to come into the shelter and spend some time with our furry friends to find the right animal for you and your home. Most animals in the kennels must meet all family members, including four-legged ones. Anyone interested in having their current pet meet a potential new family member, please let our staff know. Dogs will have a pet intorduction with the family dog. And all pets must meet all human family members. Once an animal finds his or her way into your heart, you would need to fill out an adoption application. Once you’ve been approved, you could take your new family member home. Please keep in mind that out-of-state adoptions may have additional fees to cover the legal policies for animals crossing state lines. IF YOU ARE INTERESTED IN ADOPTING A CAT PLEASE CLICK HERE. IF YOU ARE INTERESTED IN ADOPTING A DOG PLEASE CLICK HERE. If you know the breed or size of pet you are interested in, but you haven't found one on our petfinder list, you can fill out a want list application. We keep our want list applications on file for 6 months and when you have an approved want list we will call you when we receive a pet that matches the one you're looking for. Please keep in mind that depending on the breed, it can take months before we have what you're looking for. Click here for a WANT LIST APPLICATION FOR CATS. Click here for a WANT LIST APPLICATION FOR DOGS. All animals in the shelter have already been spayed or neutered, vaccinated, dewormed, and treated for fleas, ticks or earmites as needed. Upon adoption, our animals will have AVID microchip implanted just beneath the skin above their shoulders for rapid identification should the animal stray from home. In addition, you will also receive a free collar and tags for your new baby. Dogs living within Franklin County should also have a current county license and adopters can purchase one before leaving the shelter. All cats are tested for Feline Leukemia and FIV before being placed in our adoption area and are free from those diseases. Our cats go home with a cardboard carrier for transportation. Animals available for adoption have been started on their series of vaccinations, but adopters need to take their new family member to the vet within 14 days of adoption to receive a rabies shot and general checkup . Click here for dogs up for adoption. Click here for cats up for adoption.